There are numerous ways to deposit and withdraw money from your online casino account, but finding a reputable method you trust can be a daunting experience. Many online casinos recognize players only want to transfer funds with a trusted service, with one of the leading options being Neteller – we explain more about this service and how to deposit using Neteller at the leading online casinos. Why is Neteller popular at online casinos? Specifically created with online gambling in mind, Neteller is an e-wallet service which is recognized by a majority of the leading online casinos, providing a secure and trustworthy service to manage real money transactions between your bank account and online casino account. 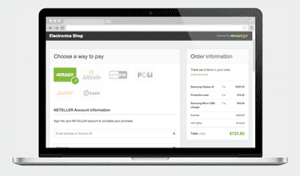 Not only is Neteller popular because of its reputation for being safe, but it’s also incredibly fast and simple to use, making the process of depositing funds into your playing account quick and hassle-free. Neteller virtually acts as a middle-man between your personal information and the casino itself, which can be reassuring for some players who are wary about handing over banking details to online vendors. This means funds are not directly deposited from your bank account into your casino account, with players required to fund their e-Wallet (Neteller) account from which you can then deposit funds to at a casino of your choice. Additionally, most transactions you will process through Neteller are completely free of hidden charges. Neteller is also available to use on your mobile device, enabling players to make a deposit and play for real-money from smartphones or tablets anywhere, anytime, providing you have an internet connection. As mentioned above, depositing funds into your online casino account is easy when using Neteller. First of all, you will need to create an account through Neteller and ensure you have funds in your e-wallet account. Once you have money in your Neteller account, simply visit the online casino of your choice and sign in before heading to the banking section of the site. From there you will see a list of withdrawal options, from which you select Neteller. All you need to do now is fill in your Neteller account details and the amount of money in your local currency you want to deposit into your online gaming account. As soon as everything looks right, hit the confirmation button and in a matter of seconds you’ll see the money appear. You are ready to start playing a casino game of your choice for the chance to win real money. Of course, like all good concepts, Neteller has its fair share of competition, with an expanding number of e-Wallets currently on the market and available for players to use when depositing and withdrawing funds into their casino accounts. Skrill: Established in 2001, Skrill is a London-based company which provides instant money transfers through the same concept as Neteller. Skrill is also very reputable, providing players with an additional layer of protection on their financial information when transferring funds online. Paysafecard: Paysafecard is slightly different from Neteller in that it’s a pre-paid voucher that’s purchased from real life retail outlets, not just an online service. The card can be loaded with a varying amount of funds in exchange for a unique PIN number and then used the same way as a standard credit or debit card to transfer funds online. Flexepin: This is a pre-paid voucher that lets players’ top-up their accounts by making fast, stress-free payments. Because it is a pre-paid service, it once again eliminates the risk of exposing your personal and baking details online and allows you to gamble anonymously. Most online casinos support Neteller, but that doesn’t mean they can all be trusted. To avoid playing at a casino with a shady reputation, we have collated our list of the safest online casinos available for players. Our top rated casinos mentioned below all support Neteller as a method of withdrawing funds into your account, whilst they also offer a lucrative sign-up bonus to match your initial deposit and get you started on your winning way. Head to any of our recommended casinos to see if the venue accepts players from your country, with deposits available using your local currency. Neteller is a world-wide service widely offered by casino vendors across the globe. Many countries in the world use Neteller to fund their sports betting accounts, with India, Australia and the UK three of the biggest exponents. You can read more about betting sites accepting Neteller.